This is Rudy Wimmer. He is one of a handful of people giving some hope to a relative beer wasteland. Rudy is the proprietor of Kaiba, a Belgian beer bar in Shanghai, China. It's really a very nice café. I know this for two reasons: (1) because Rudy is a righteous dude; and (2) because the title on his business card says "Beer Lover." He's in Belgium at the moment meeting brewers and other contacts helpful to the cause of bringing better beer to his café. Meanwhile he's also opening a second location in Shanghai. One of the coolest things I learned about Kaiba: Rudy makes a serious effort to keep his beer prices low, even while other places unscrupulously gouge customers with what amount to $7 glasses of cheap lager. As fellow Beer Lovers, we see that sort of gouging in expensive cities where beer inexplicably becomes a precious commodity (Paris anyone? New York?). We support all efforts to undercut such thievery. I've never been to Shanghai. But when I get there, eventually, I now know where to drink: 528 Kangding Road, Building D, 101. 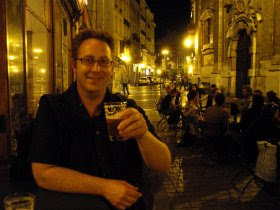 Here we see Rudy enjoying a Zinnebir at the Soleil café in downtown Brussels. Incidentally, you could throw a rock down that street and possibly hit the awning of the new Moeder Lambic.
" We support all efforts to undercut such thievery." Vigneronne for Your Great Thirst and Mine. Junior is a Gueuze Man.